Visit a flower garden in the summer and you’ll see and hear lots of activity. Bees are buzzing and busily moving from flower to flower. Butterflies are quieter, but they’re visiting the flowers too. Ladybugs crawl and fly about. If you’re lucky, you might even see a hummingbird or two. What’s going on here? Why is everyone so busy? These animals are attracted to nectar in the flowers. Nectar is a sweet liquid deep inside a flower. It provides food for bees, butterflies and even bats. These animals need nectar to grow, and also to lay eggs. Plants help animals, but the animals are helping the plants too. When bees and other animals move around flowers, they take pollen, which forms on the male part of the flowers, the anthers, and move it to the pistils, or female parts of the flowers. 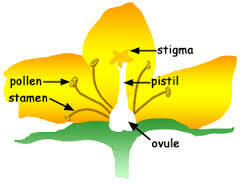 If the pollen lands in the right spot, it moves down through the pistils, to the eggs, which are inside the flower. Once the pollen meets the egg, a seed is formed. Seeds are usually formed in fruit. A berry is a fruit, so is an apple. Even a pea or tomato is a fruit because they contain seeds. Once the fruit is mature, it releases the seeds. The seeds land on the soil and create new plants. Seeds can’t get up and walk, of course, but they move away from the parent plant in many ways. By moving, they can grow in a place where there’s enough water, nutrients and light. Seeds have many ways of moving. Sometimes the wind blows them about. When animals eat the berries, the seeds come out in their poop. Some seeds, like cockleburs, attach to people and animals for a ride. A video explaining the types and processes of pollination in plants. Question: What happens if a flower isn’t fertilized? Answer: Sometimes a flower won’t receive pollen and develop seeds. Bees and other pollinators don’t come out in rainy, cold weather. Then the flower dies and drops, without producing seeds. Question: Do all plants have both male and female flowers? Answer: Some plants produce male and female flowers. Pumpkins and cucumbers, for example, have some flowers that are male and some that are female. The female flowers have a little bump at the base of the flower. This bump becomes a fruit if the flower is fertilized. Enjoyed the Easy Science for Kids Website all about Pollination info? Take the FREE & fun Pollination quiz and download FREE Pollination worksheet for kids. For lengthy info click here. Declan, Tobin. " 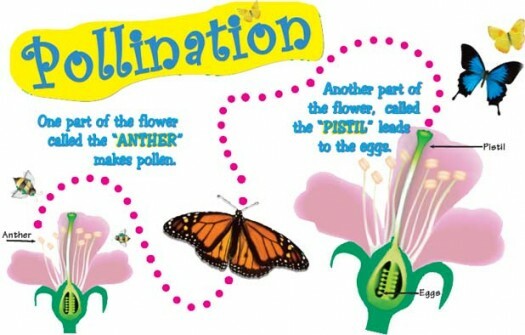 Pollination and Fertilization Facts for Kids ." Easy Science for Kids, Apr 2019. Web. 21 Apr 2019. 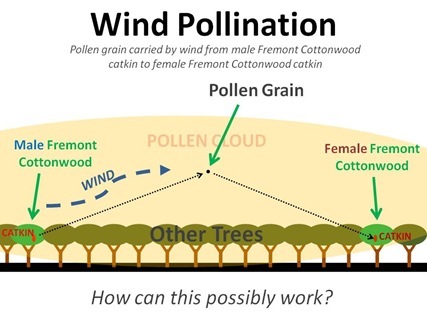 < https://easyscienceforkids.com/all-about-pollination/ >.